Turns out this deal is even better than we thought. Apply coupon code RAV20100 at checkout for an additional $7 off to reduce the price to just $36. Nice. Portable batteries are great for keeping your phone juiced up on the go, but many aren't very quick at delivering their precious electrons. 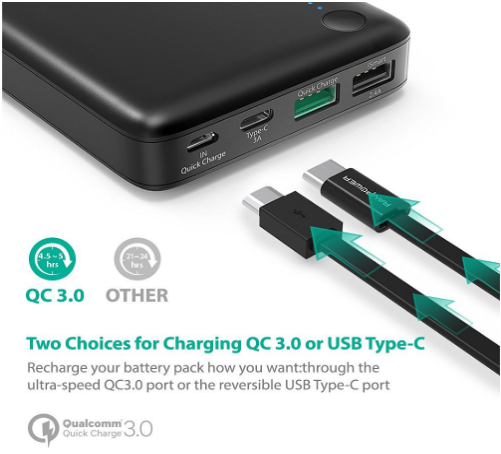 Some do have a QC 3.0 port, which is great for certain devices, and a few others have a USB Type C port with 5V/3A which is perfect for a completely different group of devices. But what are you supposed to do if you need both methods of fast charging? Well, you could carry two different batteries, or you could buy a RAVPower 20,100mAh battery that has both outputs in one tidy package. We like this battery at AP. In fact, we featured it in a deal alert last year when it was on sale for $47.99. We like it even more now that it's on sale for $42.99, $5 less than last time and an all-time low price for this model. For your money you get a capable battery with output ports that can rapidly recharge almost any notable flagship on the market. The battery has a 4.7 star rating with nearly 600 reviews, so there isn't much doubt that you are going to like it. Sounds like a gadget you'd like to add to your arsenal? Then here's the link, follow it to buy one for yourself or to read the full product description and specifications.